VanDrunen, Michael Horton and Kim Riddlebarger. profoundly wrong in some important ways on this subject. Two Kingdoms theology teaches that the Christian necessarily lives in two kingdoms, the common kingdom and the redemptive kingdom. Here is a basic primer in two kingdoms theology. For further study I would especially recommend David VanDrunen’s book Living in God’s Two Kingdoms. But in a nutshell, this theology teaches that all of our common cultural activity such as art, business, music, politics, education and the like are all part of a common kingdom which is ruled by common grace, which cannot be said to be distinctly Christian, which is not the business of the church and which is ruled by Christ in His capacity as God, not by Jesus as the Messiah. Christ as Messiah rules over the church, and it is in the church that all of our redemptive expectations are focused. Redemption therefore has nothing really to do with our common cultural life. People in Reformed circles are accustomed to talking about the “cultural mandate” of Adam and Eve. This was the instruction that God gave them in the garden to take dominion over creation. Many in Reformed circles, especially Dutch Reformed circles, speak of our salvation as being the restoration of the cultural mandate. By being freed from the curse of sin, the redeemed believer is now free to continue and finish the mandate which God gave Adam. They commonly quote Abraham Kuyper’s statement, “There is not one square inch of creation about which King Jesus does not declare, ‘This is mine! '” The redeemed Christian therefore needs to be about the business of redeeming politics, redeeming art, music, business, etc. Church becomes less important to such “cultural transformationalists.” Christianity is expressed mostly outside the church, not in it. Many in this camp even believe that the works we do in this present age (buildings, works of art, inventions, etc) are not destroyed at Jesus’ second coming but persist into the eternal state, and that therefore the Christian today is very literally engaged in the work of building the kingdom of God. The church is mainly important then as it energizes and educates me to go out in the world and redeem culture. To these believers, the eternal state is largely a continuation of the present age, with sin removed. This camp is associated with Abraham Kuyper and especially Herman Dooyeveerd. The “Two Kingdoms” theology attacks this thinking at every point. Their argument is that Christ was the second Adam and completed the work God gave to Adam. Adam’s mandate was a temporary arrangement; he was under a kind of probation, and if he had obeyed, then at some point his mandate would end, he would pass the test and enter into his rest. When Christ obeyed God perfectly during His life, death and resurrection, He completed Adam’s mandate and that mandate now is obsolete, abrogated and irrelevant. The kingdom of heaven does not need to be built by Christians; it has already been built by Christ. When He comes again, He will establish His kingdom and we will simply inherit it at that point. Our Christian activity is pursued within the church, and what we do outside the church should not be considered “Christian”, according to writers like VanDrunen. It is not governed by anything exclusively Christian, but by the common covenant that God made with all mankind in the person of Noah. The covenant with Noah is seen by them as being a covenant which downgraded the covenant God made with Adam, so that the present order would be preserved. That covenant, according to 2K theology, covers all of our activity outside of the church, and is common to all people, informed by common grace and without redemptive value. Christians engage in this kingdom out of obedience and to preserve the present order until Christ comes again, but they do not do so in any sense as part of their identity as members of Christ’s redemptive kingdom. 2K thinkers such as VanDrunen allow that salvation in Christ makes me better understand my common cultural obligations, since when I submit to God’s truth I am better able to see and understand the principles by which the world works. With that introduction in place, consider the question raised in the last article. Is the fundamental dichotomy one of nature versus grace, or sin versus grace? The Reformed position is that the dichotomy is one on sin versus grace. The problem is not the way God made things. The problem is our corruption of that natural order by sin. We do not need to be rescued from a state of nature; indeed it is impossible that we ever should be so. Deal with the sin and there is no need to free us from nature. Deal with the sin problem, and nature becomes heaven. The 2K theology brings us back to the nature vs. grace dichotomy. In their view, the natural state in which God created Adam was not a state of blessedness, it was a probationary state in which Adam had to labor in order to receive his reward. That is not to say it was onerous or unpleasant. But it was not a state of blessedness for Adam. After Adam fell, this becomes even more so. The present state is fallen and it cannot be otherwise. God locked that fallenness in place with the covenant of Noah, and our salvation in Christ is not to be restored to a real relationship with God’s creation; it is to be rescued from that creation. But the witness of Scripture is clear that God gave Adam every good gift in the garden; what could He add to what Adam already had? This is not to say that the Dooyeveerdian cultural transformation model is to be preferred. It is profoundly mistaken as well, I believe. The 2K people are right to say that we are not saved in order to complete Adam’s cultural mandate. Christ fulfilled it perfectly. To say that the Christian is to engage in building the kingdom of God or redeeming the culture is, I believe, to call into question the completion of Christ’s work, and the 2K theologians are right to reject that view. Where I disagree with them is in the idea of a cultural mandate which was only temporary. I do not believe that the tasks God gave to Adam in the Garden of Eden were a test to be passed with a reward to follow. I believe that Adam already was in possession of all of the blessings God had in store for him, and the tasks given to Adam were simply a description of what it meant to be human. In Christ therefore we are restored to the dominion mandate of Adam, not as a task to be completed but simply as the true understanding of what a human being is. Therefore, all of our lives outside of the church certainly are Christian, and certainly are affected by our understanding of ourselves as member of Christ’s body. Being a Christian absolutely does change my attitude toward being a plumber or a lawyer or a policeman. It does so at a very fundamental level. This gets me back to the original issue I raised, regarding the Philippines. This is a country profoundly affected by worldview, as every country is. They have had a great increase in their prosperity over the last 100 years due to their contact with a Christian worldview. But profound problems remain. They have common grace as much as Americans do; why is America prosperous and the Philippines less prosperous, relatively speaking? Is it a geographical or genetic difference? I do not believe so. I believe it is a difference of worldview. The 2K theology advocates are advocating their view while enjoying the results of hundreds of years of Christian theologians advocating the opposite view. Common grace is not sufficient to raise nations out of barbarism, ignorance and poverty. The world was plunged into that state before Christ came. They had common grace, but it didn’t help very much. It was with the coming of a Christian understanding of science, politics and business that the Renaissance happened, freedom began to advance, technology began to develop and millions of people were lifted out of slavery and starvation. The 2K theology seems to have the inescapable consequence of the denigration of all work outside the church. I cannot avoid the conclusion (based on the 2K understanding) that non-church work, if it is not “Christian” and it has no redemptive value, is a necessary evil at best. Its real value would lie only in its ability to generate money to be given to the church or to produce converts to go to church. Otherwise, it simply maintains the current state, which is a wicked and fallen state. 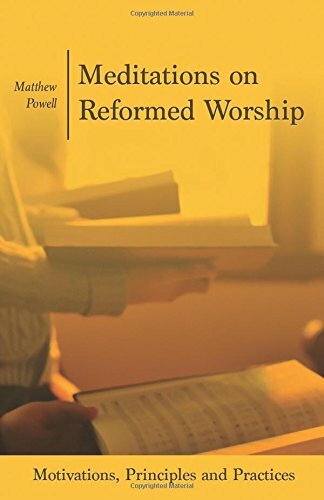 This would rob the Reformation of one of its singular achievements, the understanding of a Christian worldview that sees God’s image reflected in all of our cultural activities. Our work now is not the way we accomplish, maintain, add to, or confirm our salvation. Jesus did all that perfectly. Our work now is the way we begin to experience our salvation. I look forward to working in heaven, working at the things I enjoy with none of the corruption of sin destroying my labor or robbing it of its rightful reward. The New Testament tells us that we will be kings in the New Earth, and when God made Adam and commanded him to take dominion over the earth, He told Adam what that kingship looked like by telling him to tend the garden (labor) and name the animals (science). I look forward to fully entering into that dominion in the eternal state, and I thank God that He gives me the grace, by the power of His Spirit, to begin to learn what it means to take dominion over creation even in this present age. In my own life I have already seen some small taste of the blessings possible when I begin to live my life in the common sphere according to Christian principles, which really are just God’s principles, His truth about why He created all things, what we are to be in that creation and how we relate to God and to His creation. Jesus said He came to bring the truth, and that the truth would set us free. I don’t think Jesus came just to bring the truth about justification and the eternal state, though that would be the implications of the 2K theology, since Jesus’ Messianic work, according to them, has nothing to do with our labor, with politics, with family, with art, or with anything outside the church. Jesus came to bring the truth about everything, and that truth sets us free in our whole lives to begin becoming what God always intended for us to be. Thank you, Matt. This is very good. My first encounter with Dooyeweerd was long before you were born. Your mother and I were at a summer camp in Oregon and one of the teachers held up a Bible, "This is the Word of God," he said impressively. Then he held up a college chemistry text, "This is the Word of God," with equal emphasis. I did not know of the connection between Dooyeweerd and the 2k theology. Dooyeweerd greatly influence the Toronto School which had profound effect on Dordt College from its beginning. Thanks so much for this article and the work that you went through to prepare it. God bless. It's funny how even though 2K and Dooyeveerdianism claim to be coming from opposing perspectives, and 2K is in many ways reacting against Dooyeweerdianism, they both end up at least partially denying the actual relevance of Christianity to much of our lives. Where do the 2K proponents come up with the idea that life in the Garden was a probationary period. Is it pure speculation on their part or is there some Biblical backing for the idea. If there is some Biblical warrant for the idea of a probationary period where do they get the idea that fulfilling the test or probation results in the cessation of work? It just seems odd to me. It is like someone getting a learners permit and then passing a driver’s test in order to receive a driver’s license so they would never have to drive again. Normally we follow all of steps and tests and probationary periods in order to drive the car a lot more. First off the idea that life in the Garden was probationary with better blessings to follow appears to be fairly standard Reformed theology regardless of 2K position. Turretin argues it was in Vol 1, Topic 8, Question 6. He gives 6 reasons for it, and Witsus agrees in Vol. 1 on the Promises of the Covenant of Works, but only gives 4 reasons. And those were the only two I checked. I don't think it is quite right to say that 2K denigrates all non-church work. They very much uphold the subjective Christian attitude for non-church work as fundamental to a Christian. I am not sure how they run it down as a "necessary evil". I think that is a jump. It seems that if you make that jump you would have to say that Transformationalism thinks worship in church is the same as eating a sandwich because every action must be done to God's glory. My main question for you is about the Cultural Mandate being continued. I am going to need a little more scriptural argumentation. I understand the Reformation brings about cultural gains, but why I think is debatable and in the end it is a historical argument. If the dominion mandate is continued, why is it not repeated in Genesis 9? Why does the Great Commission not contain a Dominion Mandate? Lee's right, the probationary view of God's covenant with Adam is common. It's implied by the Westminster Standards, I think, where it says that God "promised life to Adam on condition of obedience." But it's not universal. The Belgic Confession does not seem to support the idea, though. I wasn't able to find any reference to it in Calvin. Hodge does support the idea of a probation, though he is tentative- he says, "it seems reasonable." Even the language of "fall" it seems to me doesn't support it. The only thing Adam lacked in the Garden was perseverance- he was changeable. But what was promised to Adam? What could he gain? He already had fellowship with God and dominion over creation. He already had life- the Tree of Life was in the garden with him already. What is the difference between Adam's state in Eden and our state in eternity? As far as I can see the only real difference we know is that we cannot possibly fall from that state, but is that due to some inherent difference in us, or because of the incorruptibility of our head, Jesus? I'd argue for the latter, which means that there really is no inherent difference in our essential human state from Adam's. There is the question of marriage, which puzzles me. There was marriage in the garden which could lend support to the idea that it was a temporary institution, since there is no marriage in heaven. Even there though one could say that the intention from the beginning was for marriage to be a sign of what God always knew was coming, the marriage of Jesus with His church. But even there, we must ask- was the probation intended to be prolonged long enough to fulfill God's command to "be fruitful and multiply"? That would be quite a long probation. If not, you would still have a difference in the post-probation state under the covenant of works (since there would be marriage) and in our eternal state (since there would be no marriage), so you still would have a difference between the two, which must simply be chalked up to God's sovereign plan. As far as its lack of repetition in Genesis 9, I guess I'd ask, why would we expect it to be there? Lee, it's true that the 2K theologians don't exactly denigrate church work. I think they know better than that. But I think it is the "good and necessary consequence" of their theology. In their theology, common cultural work truly is polishing brass on a sinking ship. It has nothing to do with what we will be in eternity, and nothing to do with Christ's Messianic kingdom. So what exactly is its value? It's necessary, sure, but only because we currently live in a fallen world. By "necessary evil" I don't mean to say it's a moral evil from their perspective. I mean it's just basically an unpleasant chore that must be done. My Scriptural argument for the continuation of the dominion mandate is that basically everything commanded of Adam is also commanded of the Christian. He is to take dominion of his labor, his time, his words. He is called a king and a priest, states that will continue in eternity. I think that every indication is that labor will continue in eternity- Isaiah 65:21-22, for example. What does it mean that we will be kings in eternity, except the continuation of God's mandate to Adam? What aspect of what was said to Adam will be absent in eternity? The only difference I can see is that we cannot fall from that state, because of, as I said, the incorruptible perfection of our covenant head, something Adam lacked. But we as human beings will be what Adam was intended to be, and that is something we begin now. Our sanctification is the renovation of our moral state. So I guess I'd ask- in what sense do God's instructions to Adam no longer apply? In what sense do they not continue? I guess I would expect a repetition in Gen 9 because if the Cultural Mandate is what it means to be truly human, then one could expect to find it again in the promise made to the whole world about not flooding it again. If we are understanding work as an unpleasant chore rather than evil, I could probably live with that. Genesis 3 sounds a lot like an unpleasant chore to me. It was meant to be a curse after all. I guess I would say that it is not that Adam's mandate no longer applies but rather that it is fulfilled in Christ. We are kings in eternity because we are in Christ, the Last Adam, who has Dominion. We have rest, which I would say was one thing that we have in eternity that Adam did not have in the Garden, because unlike Adam Christ passed and gained the rest that He gives to us. The cultural mandate can only be a failure to us today as Christians. Genesis 3 I think refers back to this mandate. Fruitful and multiplying is now plagued by painful childbearing and the sin racked relationships of husband and wife. The taking dominion is now plagued by toil and work and weeds. Only when the Second Coming happens will these last vestiges of sin be removed. This is why I am not sure I can completely agree with your thesis. I think 2K does put the problem squarely with sin. Even nature is plagued by sin and we cannot be fully restored to a right relationship with nature until Christ comes in judgment and the world's groaning is answered. And only 2K focuses on Christ as the answer and the fulfillment of Adam, rather than preaching our duty remains cultural dominion. Lee, the question isn't whether work is an unpleasant chore under the curse- of course it is. But the question is whether that is in the nature of work itself. Was work an unpleasant chore for Adam before the fall? And you're saying our dominion in heaven will not be seen in any of our activity (despite Isaiah 65) but just in our covenantal identity in Christ? I'd say we have rest in heaven because we have no possibility of losing our blessed state because of the incorruptibility of our covenant head. But it seems to me that many descriptions of the eternal state in the Bible have us active and working. It's my experience that even now, work is not the problem. Most people I know enjoy work. They love the feeling they get when they achieve something great. It's all the sin that's attached to work which is the problem. Adam didn't start working in Genesis 3. The curse wasn't that he had to start working, it was that his work would be plagued with the effects of sin. So if man's dominion over creation was right at the essence of the image of God, and Christ restores that image in us, then we will be restored to that dominion that Adam had, and that dominion must start to be restored now since Christ is restoring the image of God in us now. It seems to me that VanDrunen really summarized this debate rather well when he said Transformationalism is "creation re-gained" and 2K is "re-creation gained". That seems to be what we are going around here. As for your specific questions I will have to think on them for a bit. I haven't had a minute these last couple of days. Are there going to be any more posts? I think that quote from VanDrunen well illustrates the very point I'm making. If it's "Recreation gained" then our future existence is something all new. Salvation comes by escaping our present existence into something new. Nature therefore is to be escaped, not to be restored by the removal of sin. This would fly right in the face of the whole Reformed worldview, I believe. It would deny the very existence of such a thing as the Protestant work ethic. It would mean that science and industry and invention were largely wastes of time, and the good Christian should focus instead on religious things, do the minimum to get by in his job, avoid sin and wait for heaven. I don't think that is the Reformed worldview, and I don't think it's Biblical. Thanks for your responses! Yes, I think I will write some more about it. See you at Classis. I look forward to Classis where we can see if we can start a giant debate around a dinner table. That could be fun. But I still think saying the 2K group wants to escape this world is not quite right. Horton specifically states that salvation is not escaping this world, but rather the next world breaking into our own. Maybe that changes things. That sounds great! I love arguments at Classis, as everyone knows. Don't misunderstand me- I don't think Horton and VanDrunen are heretics or anything. I like an awful lot of what they have to say. It's more a matter of emphasis I think. But I do think I'll flesh out some of my ideas some more in future posts. I'm enjoying your series through the "Escondido Theology" by the way. Alright Matt, I would like you to respond to this summary by VanDrunen. I like to describe the two kingdoms doctrine briefly as the conviction that God through his Son rules the whole world, but rules it in two distinct ways. As creator and sustainer, God rules the natural order and the ordinary institutions and structures of human society, and does so through his common grace, for purposes of preserving the ongoing life of this world. As redeemer, God also rules an eschatological kingdom that is already manifest in the life and ministry of the church, and he rules this kingdom through saving grace as he calls a special people to himself through the proclamation of the Scriptures. As Christians, we participate in both kingdoms but should not confuse the purposes of one with those of the other. As a Reformed theologian devoted to a rich covenant theology, I think it helpful to see these two kingdoms in the light of the biblical covenants. In the covenant with Noah after the flood, God promised to preserve the natural order and human society (not to redeem them! ), and this included all human beings and all living creatures. But God also established special, redemptive covenant relationships with Abraham, with Israel through Moses, and now with the church under the new covenant. We Christians participate in both the Noahic and new covenants (remember that the covenant with Noah was put in place for as long as the earth endures), and through them in this twofold rule of God—or, God’s two kingdoms. The “transformationist” approach to Christ and culture is embraced by so many people and used in so many different ways that I often wonder how useful a category it is. If by “transformation” we simply mean that we, as Christians, should strive for excellence in all areas of life and try to make a healthy impact on our workplace, neighborhood, etc., I am a transformationist. But what people often mean by “transformationist” is that the structures and institutions of human society are being redeemed here and now, that is, that we should work to transform them according to the pattern of the redemptive kingdom of Christ. I believe the two kingdoms doctrine offers an approach that is clearly different from this. Following the two kingdoms doctrine, a Christian politician, for example, would reject working for the redemption of the state (whatever that means) but recognize that God preserves the state for good purposes and strive to help the state operate the best it can for those temporary and provisional purposes. The whole interview can be found at the Credo Blog.